There are a lot of products out there that are marketed to make you believe that you need these items to remove stains in your carpet or your clothing. The truth is that you can achieve almost identical effects by using things you already have in your home. I’ve cleaned countless carpet stains (three young children stain carpets – it happens) and clothes stains using just a few simple household items without having to buy anything new. If I spy a carpet or upholstery stain, I make a paste by mixing 1/4 cup hydrogen peroxide (the usual concentration you buy at the pharmacy or the grocery store) and 1/4 cup baking soda. I mix it until it is consistent and forms a white paste that’s about the same thickness as toothpaste. I just spread this paste over the area of the stain and rub it in vigorously. I let it sit for about fifteen minutes and rinse it thoroughly, then let it dry. This takes away most stains, just like that. If I find a stain on light-colored clothing (particularly yellows or whites), I use the same exact substance as above. I scrub that into the stain, then I let it sit for fifteen minutes or so, then I toss the garment into the wash. This gets out most simple stains. For darker-colored clothing, I actually just use a stick of clear underarm deodorant. I rub it vigorously into the stain as soon as I notice it, then make sure to wash that item fairly soon. Again, this takes care of most stains on dark clothing (or at least makes them disappear into the color or pattern of the shirt). If I’m particularly worried about a stain, I’ll follow up the above methods by taking a damp bar of soap and grinding that bar of soap into the stain, then follow that up with a washing. A friend of mine does a similar thing, but she uses a couple of squirts of dishwashing liquid to take care of the stain. One particular challenge for these mixtures is grass stains. For those, I pull a little bit of cream of tartar out of the pantry and rub it into the stain, then I rub the spot down with a bar of soap. This seems to be really effective at removing grass stains. Another challenge is blood stains – a child skins a knee while learning how to ride a bike or something and you find yourself with a blood-stained sock or pair of pants. For this, I use the peroxide and baking soda mix. I rub it into the item, then I put the entire item into really cold water and let it sit overnight, then I wash the item as normal. Blood stains seem to disappear! A final tactic, one that saved me in an embarrassing situation once: if you spill some red wine on your shirt, follow it up by spilling some white wine on your shirt. Then head to the bathroom, rinse the spot thoroughly, and follow it with a bit more white wine if needed. For some reason, this really works well for removing unexpected wine stains from shirts and can really save you in a pinch at a party. 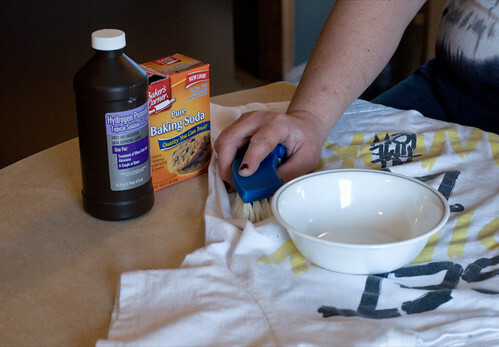 The cost of these solutions is miniscule compared to the cost of buying a bottle of carpet cleaner or buying a marketed stain remover, yet I’ve found that these homemade solutions work just as well as the marketed ones for most stains.